Only Masters will be classified up to five (5) years since last earning the requirements of a master’s title irrespective whether they do not meet the requirements of being classified. National Masters and Regional Masters are permanently classified. All players who are champions of at least three (3) National Tournaments are recognized as National Masters. The distinction among National Masters will be the number of National Tournaments won. A four (4) star National Master has won four (4) National Tournaments and a six (6) star National Master has won six (6) National Tournaments. All players who are champions of at least three (3) Regional Tournaments are recognized as Regional Masters. The distinction among Regional Masters will be the number of Regional Tournaments won. All players who are Champions and 2nd placers in National Tournaments (P75,000 and over) and champions in Regional Tournaments (P75,000 and below) are given the title of Master. 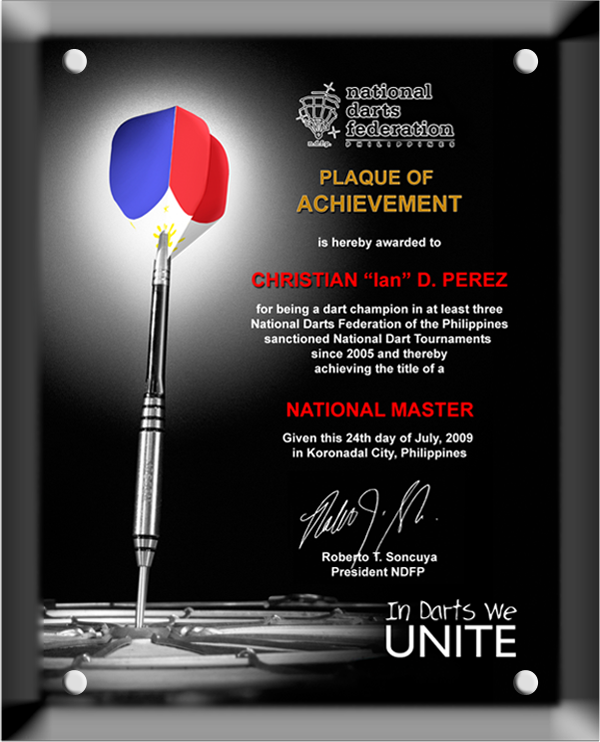 All National and Regional Masters will be given a Plaque of Achievement by the National Darts Federation of the Philippines.